The Black & Decker G48TD Grill and Waffle Baker produces four 4.5-inch square waffles at a time, making it a good choice for families. The waffles are somewhat thinner than Belgian-type waffles but there's no compromise on taste - perhaps, though, a few less calories and carbs (based on your recipe). It's reasonably priced and great for making a special, unique weekend meal for you and your partners in life. I'm really enjoying my waffle iron. It makes delicious, crispy waffles. We make a huge batch and freeze the leftovers. When we reheat them in the toaster, they come out as crispy as when first made. I read all the reviews before purchasing and was concerned about the waffles sticking and the teflon coating coming off. My first few batches of waffles were perfect. Then I used the recipe for waffles on the Pioneer baking mix package, and the waffles stuck to both the top and bottom grid and I had a mess. Here is what I learned. 1. Closely follow the directions to season the waffle iron with oil before the first use. 2. Always use a recipe that contains oil in the mix. This seems to keep the batter from sticking. (I've used the recipe on the Bisquick box with great success). 3. Don't spray the grids with nonstick cooking spray with each waffle because it discolors the waffles and it isn't needed as long as you follow rule #1&2. 4. Preheat the waffle iron as directed in the instructions until the ready light goes out (5-8 minutes) before cooking your waffles. 5. Don't rely on the light to go out to let you know when the waffle is done. Instead, set a kitchen timer for 3-1/2 to 4 minutes and remove the waffle then. Hearing the timer go off is better than having to sit there and stare at the light for 4 minutes anyway! - using two hot pads, remove each waffle attachment, one at a time, and place it in the hot water. NOTE: If you get your hot pad wet, get a new one. Water will conduct heat through the hot pad to your hands. - let the attachments soak until the stuck on mess begins to loosen. - when cool enough to touch, pick up each piece and, using a utensil approved for nonstick surfaces, scrape off the stuck-on batter. It will come off easily. -VERY IMPORTANT: when you make your next batch of waffles, reseason the attachment as you did when you first got the iron. As for the teflon coating, mine hasn't had any problems. Another reviewer said you aren't supposed to clean them while they are hot, so I always let mine cool completely before washing. This is also one reason why I used hot water (to match the temperature of the hot attachments) instead of cold when removing the stuck-on gooey mess. I used the open grill to toast hamburger buns. I didn't think it got very hot. The first time I forgot to preheat it, but the second time I preheated it (closed) and it seemed like it lost heat quickly when open. I think it works best when closed. The design of the unit is flawed--the irons are held by two flimsy clips which can easily bend or break. Most of the unit is made of metal, and when heated because extremely hot if you touch anywhere outside its plastic parts. This sounds obvious, but what is the dealbreaker are the iron plates themselves. Even though B&D claims they are nonstick and that they need to be primed with oil, they continuously stick after the first three waffles and several minutes of grilling. They do not prime. Repeatedly doing so simply makes the first batches extremely oily and inedible, and the following batches after that unremovable from the hot iron plates. The dangerous part occurs as a result of these plates--because they stick, you may attempt to pull harder to open, but the plates will not budge and you will either A) touch the hot metal exterior, causing burns or B) the clips will give way and you will burn yourself either on the iron, open element, or exterior metal surface. You eat nothing that you put into the unit and then be forced to scrape wasted food off the "nonstick" hot iron plates. I have one of these. It's from 30 years ago. My dad would make waffles in it. When he passed, I insisted on keeping it. This makes the small-hole waffles which are great for butter. The orange light on front tells when it's at temperature. This doubles as a "done cooking" light. There's a knob on the front for baking temperature. Hotter makes it more crispy outside and gooey inside. Cooler makes it dry out more but take longer to cook. The plates flip to allow you to make a grilled cheese sandwich, or pannini type goodies very quickly, without the stripes. The finish is stainless steel. The unit overall is durable, easy to use, and easy to clean. I have searched for a long time for a good waffle maker: one that makes waffles that are traditional, not belgian. Belgian waffles have too deep of squares for me and are too thick to go in a normal toaster. This waffle maker finally makes normal sized waffles, the size of a piece of bread, with small holes. It cooks perfectly every time...the waffles are evenly cooked and slide very easily off when you want to remove them. They look great and they taste excellent. It makes four waffles at a time, which was another requirement (I hate little wafflemakers...you can't feed a family on those). If you have leftovers you can toss them in the fridge and then later in a normal toaster, which makes them crisp and delicious again. I almost like them better the second time. The construction is durable and attractive, not made of that plastic junk that you normally see in a wafflemaker. I can find no downside to it's construction, all smoothly operating and simple. It doesn't get dirty, but if it did it would be really simple to pull out the waffle surface and wash it off however you want. I have no use for the flat side of this waffle iron, so I don't use it. Does what a simple waffle iron should. No extra bells and whistles. Waffles are baked to perfection. The one drawback is that the exterior gets really hot, handles included. You should be aware of this and use caution and common sense when using this appliance. The plates are reversible, but I have not used the 'flat' side. The power cord is a bit short for my liking, but the arrangement of outlets in my kitchen exacerbates this short coming. Black and Decker used to be good. Their products were well designed and quality built. This product supports "not any more". The product is cheap and flimsey. I didn't even bother to plug it in. I contacted Amazon who graciously took the item back. Forunately B & D has not messed with DeWalt, Porter Cable and Delta too much eventhough my Delta hybrid saw did have some problems upon delivery. This grill and waffle baker replaces one we have had for several years that was never satisfactory. We returned one like it believing the thermostat was broken and received an identical replacement with the same problem. (This was dealing with another department store.) 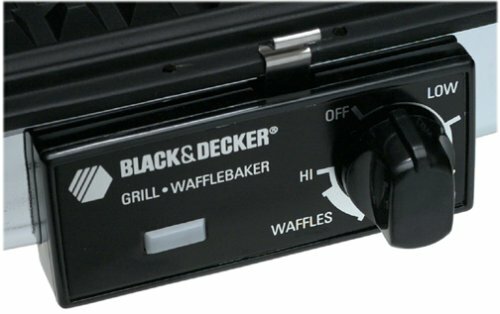 After several years without waffles, my husband began to crave them again, we so ordered the Black and Decker. It heats up in about 7 minutes and each batch of pancakes is done beautifully in about 5 minutes after being placed on the hot grids. When I first got this waffle baker, I really was disappointed. I washed the plates with soapy water and then oiled them up as described in the instructions - but my waffles were sticking worse than I've ever seen before. Basically, the first (and sometimes the second) waffle of every batch was tearing in half and I had to scrape the pieces off of the top and bottom plates using a wooden spoon. Nothing usable was left after this process and it was a huge, messy pain. Because of the big mess, I would rewash the plates in soapy water after each use and then I tried to keep the waffles from sticking by using heavy coats of cooking spray; which left subsequent waffles soggy and oily, but still didn't prevent the first ones from tearing in half. 1) Never wash those plates with soap (after the initial cleaning of course), since it takes the oil coating off - it's fine to soak them in water or to wipe them off; just don't use soapy water or you'll have to re-season them. 2) Before pouring the first waffle, I heat the baker up to the maximum temperature and then turn it down to my desired waffle heat once the first waffle is poured. This isn't important once the plates are fully seasoned, but it helps with the first few batches. 3) Be sure to put enough oil in the waffle recipe. In my case, the recipe calls for 2 tbsp but I've found that 1/4 tbsp extra makes a huge difference and probably just offsets the oil that didn't pour out of the measuring spoon anyway. 5) I don't use cooking spray at all anymore (which is more than I can say for my old waffle irons). It isn't needed at all for the waffles to come out perfectly. With these easy tweaks, I'm now able to get perfect waffle off of this every time - from the first waffle to the last. They taste great and the extras go into the freezer so the kids can warm them up in the toaster on weekends. I honestly will probably never use the grill plates since I have another electric griddle that is larger - but the waffle baker works really well. I would highly recommend it. I'm planning to purchase two of these irons. One for us and one for my son who also remembers the one handed down from my parents that looks just like this one. I think ours was a "GE" and maybe they sold the rights to B&D. The reviews mention flimsy -- what isn't today? Anyway, the customer image of the cooked waffle shows a shortcoming that may be difficult to overcome. If you look at the brownness of the cooked waffle you will notice a ring right around the waffle that is darker. That indicates the heat in that area was higher than in the rest of the plate. My suggestion would be to preheat the iron longer and with the lid closed. This will allow the entire metal plate to become more uniform and hopefully produce a more even color and "doneness" to the product. Since a "next" waffle will be started after the instant one has cooked long enough to drive off the moisture it should also have allowed the plates to get back to a fairly uniform temperature but a short empty reheat might help. I'm really happy with this unit. I've wanted a waffle maker for a while, but it was hard to justify the expense and kitchen real estate for such a limited-used appliance. I jumped on this one as soon as I saw it, since it really is 3-in-1. It works great as a waffle iron; the waffles are thin and cook just right. I actually use it most for sandwiches, as it makes any regular sandwich suddenly much tastier in just a few minutes. It also works well as a griddle, and I have made pancakes and eggs on it. I can't say enough about how great the removable plates are for cleaning. They are remarkably nonstick in the first place, but taking them off and cleaning them is incredibly easy. It's a snap to switch between the waffle side and the grill/griddle side, too.